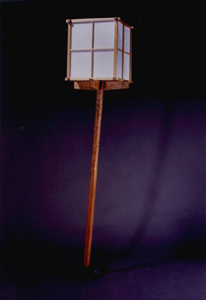 This lamp has a cherry wood post which is scribed to a rock and rises at an angle. The post rises to a pair of cross pieces which support a four-panel shoji-style shade. We found the large and very heavy rock in Point Reyes and I had to carry it for over a mile up the beach to our car.